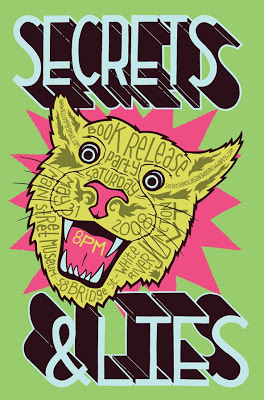 White River Junction, VT, May 20, 2008 – SECRETS & LIES is an anthology of comics edited by veteran web cartoonist Cayetano Garza Jr. which will make its debut at the 2008 MoCCA Art Festival in New York, NY (June 7-8, table C27). The book’s theme centers loosely around the idea that all fiction is lies and that the best stories tell us some kind of secret. There will be a book release party on May 31, 2008 at the Main Street Museum in White River Junction, Vermont at 8 pm. The party will also include the debut of Colleen Frake’s new Xeric graphic novel TRAGIC RELIEF. Some of the refreshments will be generously provided by The Center for Cartoon Studies.